The first thing I chose to make from Dorie's book was her Cranberry Upside-Downer. This was my first upside-down cake, but certainly not my last. I love the concept of buttery, sugary, caramel-y fruit combined with a thin layer of moist cake... what's not to adore? I can already tell this book is going to see a lot of use from me. 1. Center a rack in the oven and preheat to 350F. Put an 8x2-inch round cake pan on a baking sheet (Amy's note: I used a 9x2 inch and reduced the baking time by 5 minutes). 2. Whisk together flour, baking powder, cinnamon, and salt. 3. Melt 6 tablespoons of the butter in a small saucepan. Sprinkle in 6 tablespoons of the sugar and cook, stirring, until the mixture comes to a boil. Pour the mixture evenly over the bottom of the cake pan, then scatter the nuts over the mixture and top with the cranberries, smoothing the layer and pressing it down with a rubber spatula. 4. Working with a stand mixer, preferably fitted with a paddle attachment, beat the remaining stick (8 tablespoons) of butter on medium speed until smooth. Add the remaining 1/2 cup of sugar and continue to beat until pale and creamy, about 3 minutes. Add eggs 1 at a time, beating for 1 minute after each addition and scraping down the bowl as needed. Pour in the vanilla. Reduce the mixer speed to low and add half of the dry ingredients, mixing only until they disappear into the batter. Mix in the milk, then the rest of the dry ingredients. Spoon the batter over the cranberries and smooth the top with a rubber spatula. 5. Bake for 40-45 minutes (35-40 for a 9-inch pan), or until the cake is golden and a thin knife inserted into the center of the cake comes out clean. Remove from the oven and run a blunt knife between the sides of the pan and the cake. Carefully turn the cake out onto a serving platter. 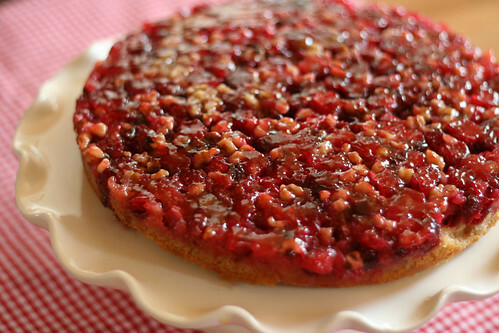 If any of the berries stick to the pan, just scrape them off and return them to the cake. 6. Warm the jelly in a small saucepan over low heat, or in the microwave. Gently brush the glaze over the hot cake. So gorgeous. I love the recipe's addition of the currant jelly! Is it also possible to use dried cranberries? DUSBAHCESI~ I've never tried it so I can't say for sure, but I wouldn't recommend it. I think the juices from the cranberries is what makes this cake so special. Perhaps try foodblogsearch.com to look for a dried cranberry cake recipe if that's what you have available to you. Best of luck! Miriam~ Yes, you can absolutely use frozen ones. The cookbook says not to thaw them first. Enjoy! Yum! I saw this on twitpic awhile ago - it really does sound fantastic! I love the flavours - red currant jelly sounds like a wonderful addition =D. that looks AMAZING. great picture. definitely book-worthy photo. This sounds wonderful. The one I have is too tart. I think yours will work better. Thanks! This sounds absolutely delicious.. and great for entertaining! That looks beautiful! It would the perfect addition to the Thanksgiving table! Looking at the picture on Foodgawker, I thought it was one gigantic Florentine, but to my surprise it is a upside down cake.....looks fab!!! Looks delicious. I'm been meaning to try one of this for ever so long .. still haven't gotten there yet unfortunately. This sounds and looks so great. I may have to go buy that cookbook. At the very least I plan to make this cake. I make this every year for my grandmother when cranberries are in season. She loves it and calls it "her cake". Last time I made it for her, it was gone before she even got a piece, it's that good! You know, this might have to make an appearance at my Thanksgiving table this year. Can't wait to try it!